Hi John, I'm looking to build a garden shed, roughly 10x6 feet in size. As with all of my building projects I like to over engineer things lol. I plan to build solid walls from 3x2 timbers laid flat and build up in layers ie. kind of like a block wall. Corners will be lapped over with the next layer giving rigidity. I plan to nail each layer on as I build up. I will build each gable end up at 45 degrees and then run roof supports from gable to gable. its kinda like the way small log cabins are built but with the timber laid flat rather than on edge. Hopefully, I would be left with a really solid construction with 3 inch thick walls that would last a lifetime, can you think of any downside to this idea? I plan to use good quality pressure treated timber. I have attached a picture of a shed built with the timber on edge but as said I plan to build with timber on the flat side. A few shed problems for you to solve. Thank you for your post. 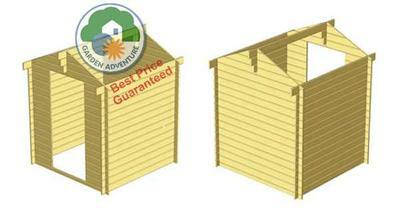 The method of your shed construction sounds to be very solid and will give you a very sturdy shed! You asked for downsides and the first as I am sure you are aware is cost. To build a shed of solid timber such as this will consume a fair amount of timber, but as you foresee a long life for this shed then your investment may pay off in the long run. My other concern would be that as you are stacking flat timbers one on top of the other that you may get some draughts if the timbers warp. However once again as you like to over engineer things you will probably have each layer screwed to the next. It will be interesting to see what you come up with.